There has never been a book or magazine that has given the reader an uncanny look at Rolex through first-hand accounting, with many never before seen Rolex Documents as well as Letters to Rolex from General Henri Guisan, Sir Winston Churchill, General and then U.S. President, Dwight D. Eisenhower, as well as official correspondence from the extremely talented, creative and passionate Director of Rolex, Rene Paul Jeanneret. The reason I started Jake's Rolex Watch Blog is because I have been extremely passionate about Rolex watch design for over a quarter century. As I have mentioned before, I bought my first Rolex Submariner over a quarter century ago when I was 16. When I was 14 I started trying to understand what made Rolex tick–literally and figuratively. My first conscious experience with Rolex was when I was 14 years old, when a family friend showed me his Rolex "El Presidente" as he called it. He told me the Rolex "El Presidente" was almost a $10,000 watch (In 1981) and he exclaimed, that the Rolex "El Presidente" was not only one of the most expensive watches money could buy, but that it was "The International Mark of Success." He went on to say, the basic message a person conveys when they can afford to wear such a watch is that "You must be doing something right if you can afford to wear a $10,000 Rolex watch on your wrist. You are clearly perceived as a highly successful man with many options." 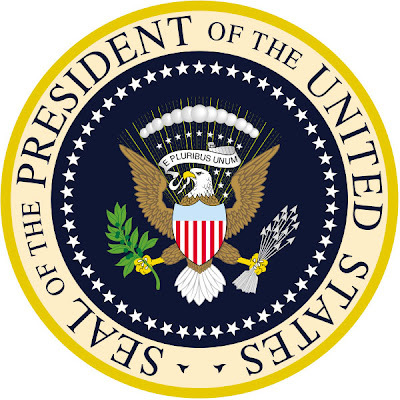 One day in the future, probably in a podcast, I will share more of this story with you in detail, but for now we will stay focused on the history of the watch dubbed "The Rolex President." I decided to publish my online Rolex Magazine and create the largest online Rolex research library, so I could share all the insight and knowledge I gained in my lifetime with the world. Also, I kept hearing many different and conflicting stories about the history of Rolex. To the best of my knowledge, Rolex is typically very quiet about their wonderful history so I decided to dig deeper and answer all the unanswered Rolex History questions. In doing so I unearthed what is probably the greatest piece of untold Rolex History, which is the story of the Rolex Moon Watches, and in particular, the story of how NASA Apollo 14 Astronaut, Edward Mitchell wore his Rolex GMT on the longest Moonwalk in recorded history. To learn more about The Rolex Moon Watches click here. In my mind, another one of the great untold Rolex history stories is the story of the Rolex President. But wait a minute!!! Is there even such a watch as the Rolex President, or Presidential, or is it the El Presidente, or is it the Day-Date, or is the Rolex President just a bracelet? Or is the Rolex President a Datejust with a Jubilee Bracelet? Is The Rolex President named after a President, or is it perhaps simply a state of mind? Then there are the people who get angry if you say "Rolex President." They will immediately correct you and say "there is no such thing as a Rolex President!!!" It is called the Day-Date." These of course are likely the same people who will get upset if you call San Francisco, "Frisco." Once I was wearing my Yellow Gold Yachtmaster and a girl who had known me for many, many years said "Oh!! Nice watch!!! Rolex Presidential. Very Nice!!!" So maybe if you wear any Yellow Gold Rolex you are wearing a Rolex Presidential!?!? I intend to definitively answer once and for all these questions in a way Rolex likely could not. Instead of writing the story and publishing it all at once, I have elected to do it as a multi part story, and this is part 1. I will roll-out the next parts as soon as I can finish them. First I want to point out that this story as well as everything I have written on my blog to date is not authorized by Rolex. Jake's Rolex Watch Blog is not affiliated with Rolex Geneva, or Rolex U.S.A. in any way shape or form, except that I have been a loyal patron of their product for many, many years. I would also like to thank the kind folks at the Dwight D. Eisenhower Presidential Library for all their gracious assistance as well as the National Archives of the United States of America. I would also like to thank the NATO Archives, The JFK Presidential Library, and the Lyndon Baines Johnson Presidential Library, as well as the U.S. Army, Navy, Air Force and Marine Archives. I would also like to thank my great pal, Leo (The Idle Swede) for sharing all of his kind insight and wisdom with me, and being a superb friend and fellow Rolex enthusiast. I would like to also thank my great pal, Michael McClure for his profound help in keeping me on track as well as Raleigh DeGeer Amyx for sharing photos of President Eisenhower's Rolex Watch as well as other great Presidential historical material. One thing, I can share with you about this fantastic story is that when it is done being written, you will learn that it is a beautiful story about much more than a watch or even a company. It is a story about human strength, and human frailty. It is a story about kindness, and humility. It is a story about some of the finest gentlemen that ever walked planet earth. In order to tell the story of "The Rolex President" we must begin with the first President of Rolex, who was also the founder of Rolex, Hans Wilsdorf. This is one our first clues, because in the United States, Hans Wilsdorf would have the title of President or CEO, but in Europe his title was Director General. 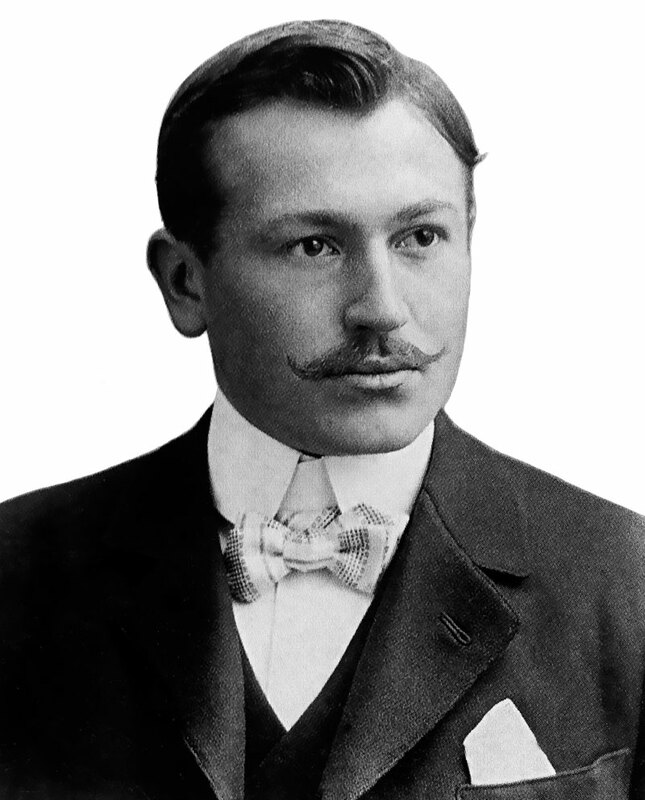 Hans Eberhard Wilhelm Wilsdorf, the founder of Rolex was born in a small village in Bavaria (now part of Germany) on March 22, 1881. When he was young man, he moved to Geneva, Switzerland, then to London England in 1903, where in 1905 he started a watch company named Wilsdorf & Davis, which was changed to Rolex in 1908. In 1919 Hans Wilsdorf moved to Geneva, Switzerland and made Geneva the official headquarters for Rolex, with its center of operations in Bienne. Rolex prospered and made tremendous technological progress with introducing the worlds first waterproof watch in 1927, named the Rolex Oyster, and a short year later Rolex introduced the Rolex Prince. The Oyster was the perfect sport watch and the Prince was the perfect dress watch. Today, the idea of a water and element proof watch is something we take for granted, but in the late 1920s it was a huge technological and horological triumph. In the early 1930s Rolex was moving along and growing by leaps and bounds, then all hell broke loose in the late 1930s when Adolf Hitler started annexing parts of Europe and started talking about his 1000 year Reich which would be taking over the entire plant. This of course made everybody very uncomfortable, the same way in which Napoleon Bonaparte did the exact same thing less than 150 years prior. The Nazi regime at one point had taken over all of Europe with the exception of five countries; Switzerland, Sweden, Great Britain, Spain and Portugal, thus Switzerland was completely surrounded by territory controlled by the Axis Powers from 1940 to 1945. The vast majority of the Swiss people were adamantly opposed to Hitler's annexation of Europe and resolved that there was not a chance in Hell the Führer would take over and enslave Switzerland. As a matter of historical fact many in the Swiss government were resolved to fight to the last man if that was what it took. Switzerland has always been renowned for being neutral, but like any people, they did not wish to be dictated to by a foreign power. The Swiss in general are very precise thinkers and they also tend to be stubborn at times. The greatly renowned Swiss General, Henri Guisan was the Commander in Chief of the Swiss Army during World War II, and to this day he remains Switzerland's most famous and beloved protector and soldier. Hans Wilsdorf and Rolex were extremely happy when the war finally ended because it had such a negative impact on their ability to do what they love, which is to make beautiful watches for people to enjoy. Hans Wilsdorf and Rolex did many kind things for the Allied Powers GI's during the World War II as we will soon learn. Rolex was originally founded in England in 1908 and moved its chief operations to Switzerland in 1919, just after World War One. In 1944, just as World War II was ending, Rolex produced their 50,000th Officially Certified Swiss Chronometer watch which was a huge milestone. It took Rolex close to four decades to produce 50,000 watches, which is profound, because today they probably produce more than 50,000 per month. Rolex executives decided they wanted to present as a token of their appreciation their 50,000th Officially Certified Chronometer Rolex watch to Swiss Army General Henri Guisan. On May 17, 1948 General Guisan wrote this lovely letter to Rolex founder and Director General of Rolex, Hans Wilsdorf. Commander and Chief and General, Henri Guisan of the Swiss Army is pictured in the photographs below. General Guisan was the descendant of Huguenot Protestants that moved from France to Switzerland in 1685. General Guisan was quite a horseman. As a matter of fact, he began his military career with an assignment in a horse driven artillery unit. In Guisan's lifetime, he witnessed the complete transformation of Switzerland from the old world to the new world–from a world driven by horses to a world driven by cars. Henri Guisan was not only the Commander and Chief of the Swiss Army, but only one of four men in Swiss history to be promoted to the rank of General. The Swiss only appoint General's in times of war, and Guisan was the overwhelming choice of the Swiss to protect them from Hitler and Nazism. In 1940, General Guisan gave a speech to the Swiss Officer Corps where he communicated to them that Switzerland would defy all forms of Nazi aggression. He told them that if they ran out of bullets they were to use their bayonets. He told the Swiss Army they must be prepared to fight to the death and that Switzerland would never surrender to the Nazi's. He suggested they use guerilla warfare techniques to outsmart the Nazi's. General Guisan told his fellow Swiss countrymen if they ever heard a radio broadcast that suggested that the Swiss had surrendered to the Nazi's, to ignore it because they would NEVER surrender under any conditions. General Henri Guisan is one of the most beloved Swiss citizens that ever lived, and there are many statues in Switzerland that pay homage to his character. With World War II behind them, Rolex started moving ahead full speed and within several short years they had produced their 100,000th Officially Certified Chronometer watch. Talk about growth and success!!! In several short years Rolex made as many watches as they had in the last 38. It is interesting because in the letter above, Sir Winston Churchill says "I look forward very much to receiving this Wristwatch." I know the feeling!!! 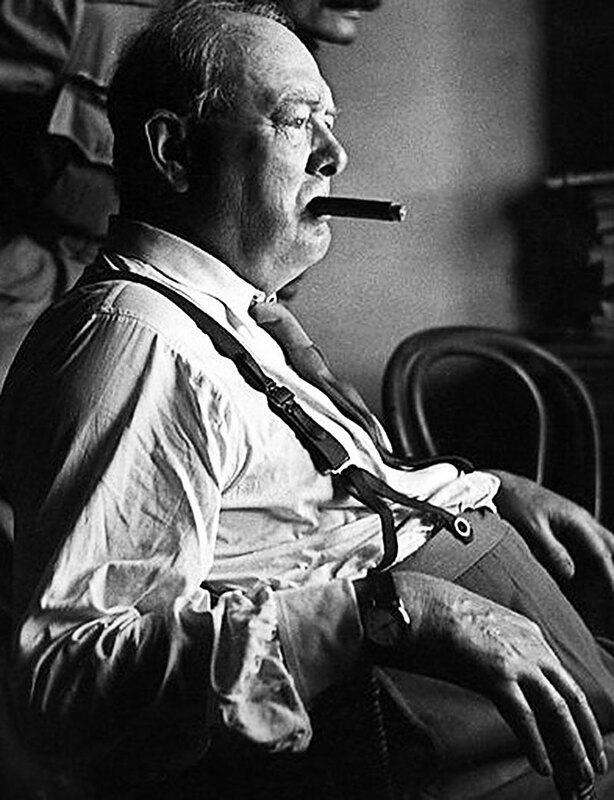 Sir Winston Churchill's is pictured below wearing his Pink Gold Datejust. Sir Winston Chruchill completed the painting below titled "Sunset Over The Atlas Mountains" in 1935 from his balcony at the Mamounia Hotel in Marrakech. Winston Churchill once wrote of his love for painting: "When I get to heaven I mean to spend a considerable portion of my first million years in painting, and so get to the bottom of the subject." In 1943 Churchill took President Roosevelt to Marrakech to view the mountains after the Casablanca Conference. In late 1951 Rolex produced their 150,000th Officially Certified Chronometer watch and they decided again to celebrate by offering it to another distinguished gentleman of great achievement–the highly decorated American 5 Star General who was serving as the NATO Supreme Allied Commander of Europe at the time–General Dwight D. Eisenhower. The Swiss in general loved Ike because he put an end to the senseless Nazi agression in Europe, and the extcutives at Rolex likely realized that if it had not been for Ike, there was a high likelyhood that if and when the Nazi's took over Switzerland, they more than likely would have replaced the Rolex Crown logo with the swastica if they had the chance. 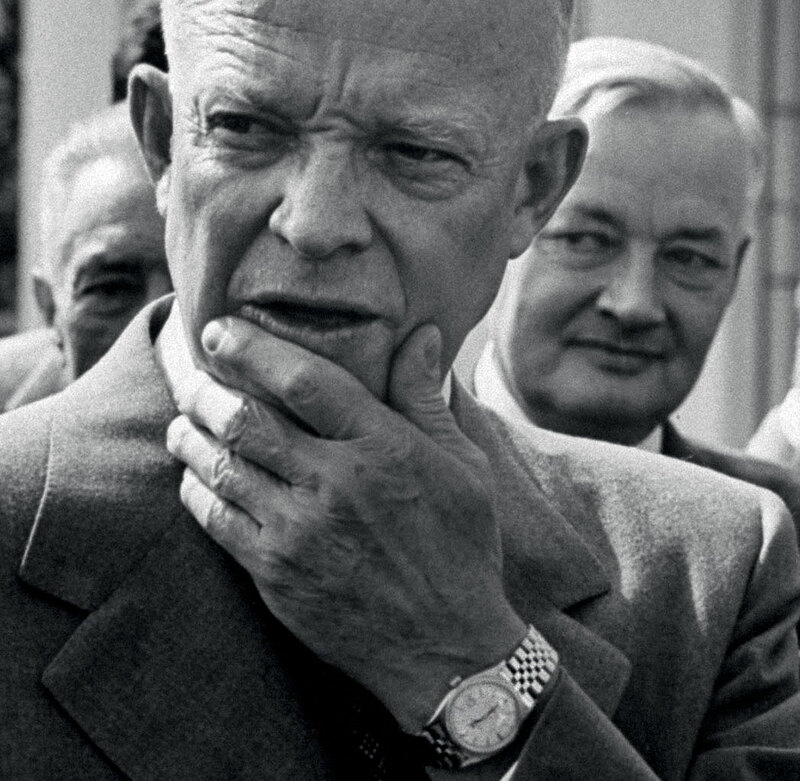 Basically, Eisenhower, just like General Guisan was their savor, protector and hero, and in the exact words of Rolex Director, Rene Paul Jenneret, to Eisenhower "this watch is a very small token of our admiration and gratefulness." Rene Paul Jenneret continues on "Needless to say there is absolutely no question of any advertising tie-up in connection with this offer. This was understood all along with General Guisan and Winston Churchill. Incidentally, we have a whole range of other world-known figures wearing Rolex watches, but naturally no mention is ever made of their names in our advertising, unless they specifically and of their own initiative authorize us to do so. This is the case with Lord Louis Mountbatten, yet we have never made use of his kind permission." Here is a copy of the letter from then Rolex director Rene Paul Jeanneret to Nana Rae, who was close family friend of Dwight Eisenhower. For the record, Lord Louis Mountbatten was the Admiral of the British Fleet, 1st Earl Mountbatten of Burma, and uncle of Prince Phillip, Duke of Edinburgh, who is currently the husband of Queen Elizabeth of England. Rolex promised not to mention these superb "tokens of admiration and gratefulness" and as a historian, I respect their promises made more than a half-century ago. That being said, litterally all the people mentioned in this story are no longer alive and I think it is a great piece of history which I feel deserves to be shared, particularly because it now belongs to the ages. All of the documentation shared in the story is public record that came directly from the Eisenhower Presidential Library, The National Archives and The NATO Archives. In Part Two, as seen below, we will examine the beginning of the flourishing relationship between President Eisenhower and Rolex, and learn a great deal about the superb character of Dwight Eisenhower and Rolex Director, Rene Paul Jeannette.